We're not surprised the Man of Steel is on the March cover of TRAIN magazine. Henry has been working hard for the last few months as he prepares to become Superman once again. Just today we got another great picture from the Michigan Barbell Classic, where he was his trainer's spotter (see the rest 1/2). 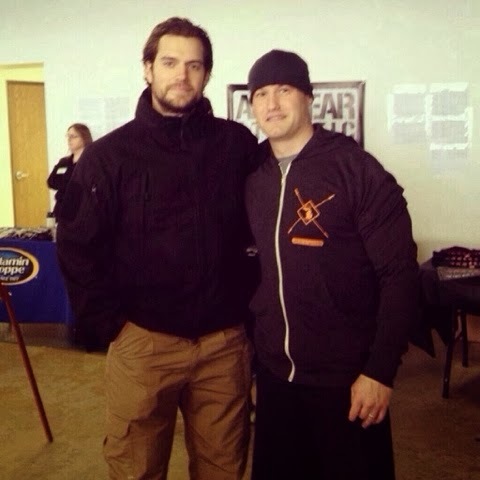 A few weeks ago Moviehole also had a must read interview about Henry's determination to look the part, as filming on the Man of Steel sequel gets ready to go in Detroit. We'll bring you the details of his interview with TRAIN magazine as we get them (UPDATE: Read a preview below). Go Henry! So is he ready to do it all over again? The March issue of TRAIN is now on sale. Really awesome pictures collection. First poster photo is outstanding !! Henry "Polite & Courteous Like All Proper Chaps"
Henry Spotted In Detroit Sporting A Super Beard! It Is Called The SUPER Bowl!